Celebrated this Sunday afternoon in Cambridge at Deli on the Corner in Victoria Street – the exhibition opening of dIGITAL EYEs – the work of six Cambridge photographers. Characterful and colourful the Deli on the Corner café – one of Cambridge’s most popular – is home to much visual delight. 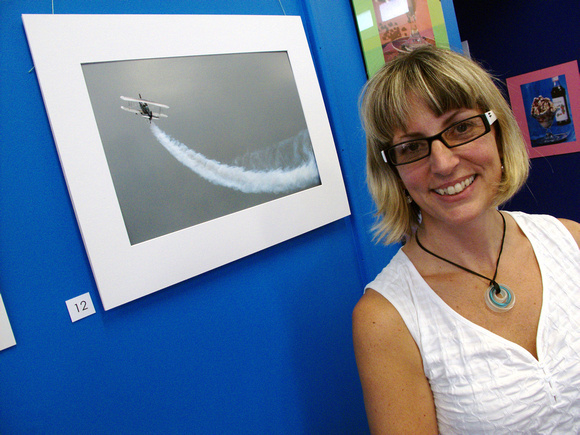 Above photographer and Cambridge Edition editor Ann Huston – one of the six – with her work – “Flying High” – a photograph taken during Armistice in Cambridge last year. Ann tells me the plane is a Pitts S2S Special piloted by Noel Cruse.